One of my Lemon Chiffon Brahma chickens, Amelie, has had a tough time lately. First she contracted Fowl Pox and had a difficult time eating due to the sores around her mouth. Then she came down with coccidia followed by a respiratory illness. Now she’s battling wry neck. It’s been a nightmare for her but she’s a fighter. She’s been living in the house with me for a couple weeks. Frigid weather compounds health issues in chickens (or anyone). They use their energy to keep warm rather than fight illness. Wry neck symptoms include head tilting to one side and loss of balance. They may aim to peck at food and miss it. These are early symptoms that can go from bad to worse, quickly. As it grows more severe the birds completely lose control. They may appear to have spasms or panic and flop around with their head curled to one side or their head may even go between their legs while their body flounders around in violent episodes until they exhaust themselves. It’s awful to witness. The image above is with Amelie’s head propped up on my knee for support. If I didn’t support her head it would be tightly under her. 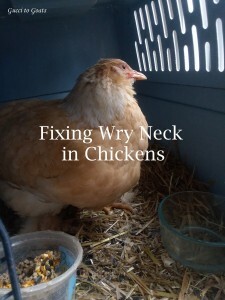 Wry neck is often caused by vitamin deficiencies (Vitamin E & Selenium). In Amelie’s case, I knew due to all her recent illnesses and inability to eat well that she most likely had a vitamin deficiency. If it’s cold weather, bring them inside or keep them under a safe warmer but don’t let them get too warm. Keep them in a quiet place away from fluorescent light and sudden movements. 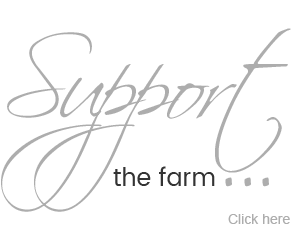 Many sites recommend keeping the chicken in a dark place. From my observations this makes this reactive, spastic affliction much worse. Keeping a soft light positioned overhead at night when there’s no natural light helps the bird correct it’s position after a spasm and seems to keep them calmer overnight. Also, Amelie really likes being in a space where she can hear the other birds so I keep her in the laundry room with the chick brooder. She can hear the adolescent chickens chattering and she makes happy trilling noises with them. I recommend you observe your bird to see what works best for them. Whatever carrier or crate you use to keep the bird in needs to have traction on the floor. Don’t use shavings or straw or anything that can get into the birds eyes and irritate them. They will be on their head a lot so it’s very easy to get an object in their eye and they have no way to remove it themselves. I had an old car floor mat I use. It doesn’t move so the bird can correct itself easier. Cleanup is easy as well. This also allows them to see and peck at bits of food since they may not be able to scratch through bedding. Immediately take them off medicated feed. It has a thiamine blocker and they need to absorb all their vitamins. They need to eat vitamin rich food, especially vitamin E and Selenium. 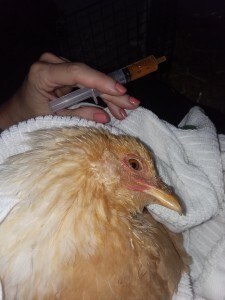 I used what I had on hand – a mix of human vitamins (reduced and crushed, except for the E – I used a full capsule mixed in), chick vitamins and egg yolk to make it all palatable and provide natural nutrients mixed in a small amount of warm water so it would go easily into the syringe for feeding. 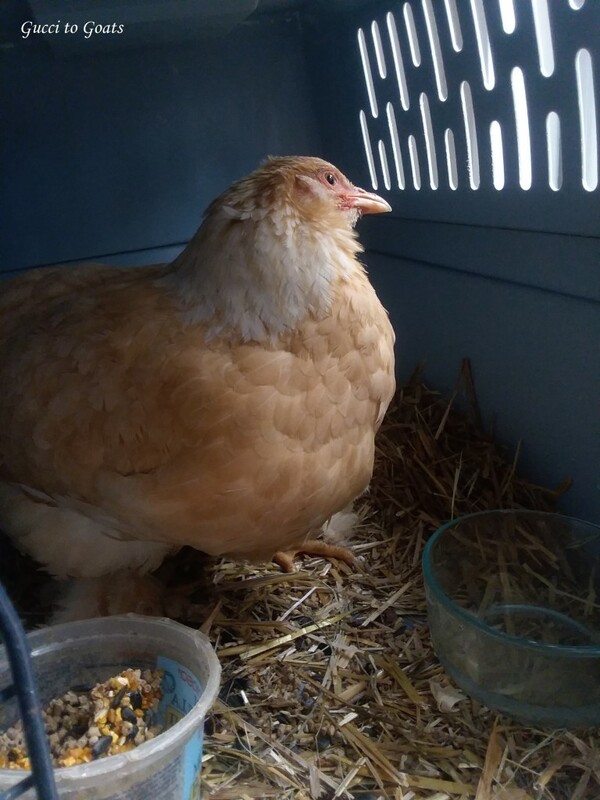 As she got better I just shared my morning egg with her – giving her most of the yolk and cutting it into small pieces mixed with her vitamins. She scarfs it down like candy and makes feeding much easier. 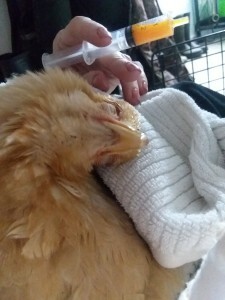 Due to the severe head tilting and spasms another feeding method is to wrap them snuggly in a towel and gently syringe liquid food into their beak, allowing them to drink it but not forcing them. Usually if you put a bit on their beak they drink it in. I only had to do this a couple days. Since it’s winter and colder in my laundry room I would keep her wrapped in the towel and place her in the crate upright so her head and neck had support. Overnight she would kick herself out of the towel but the small amount of time in the swaddle allowed her to rest in a natural position for a bit. It took two days of feeding every couple hours by syringe but she’s standing and walking on her own now (some days are better than others). If something startles her she still goes into involuntary spasms and flails around like she needs an exorcism. But, she has made tremendous progress. Depending on the severity of your chicken’s illness it may take much longer to see recovery…weeks or I’ve heard of cases lasting months. As you can see below, she still has a head tilt but is standing and walking on her own now, most of the time. I have her in a window sill so she can have natural light and a view of the others outside She gets chatty when she sees her friends. Chickens are naturally curious and I believe the view and natural light have been helpful. Watching the other animals hasn’t triggered the spasms and seems to encourage her natural behaviors. You’ll have to decide for yourself what works best for your case.